This disc was auctioned in August 2004 and probably dates from June 1972. I have no more info than provided by the auction description. It can be assumed that this is the standard released mix even though the auction description states, "it plays different to normal vinyl". I believe that reference was to the surface noise of the acetate. John Lennon & Yoko Ono, Sometime In New York City. 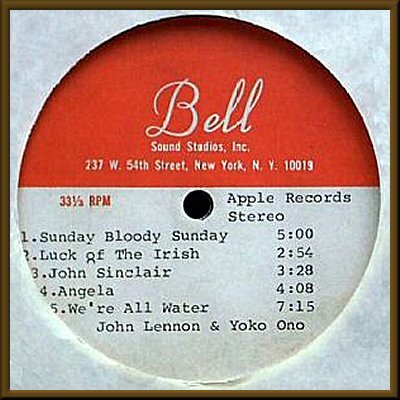 Double sided ACETATE LP from Bell Sound Studios, New York. The label on 1 side is perfect & the other side has a few bits missing from the top [see pic]. Vinyl looks VG, have played a couple of parts to check sound quality, & there is a little background noise, esp on run in grooves. This is not mint. This background noise may just be because it is an acetate, I dont know, I have never played one before, but it plays different to normal vinyl, & I know that they shouldnt really be played too often, if at all. Very heavy 'slab'. Under light the vinyl is a dark purple/red in colour & it has a few small surface marks & looks slightly dirty, so would recommend a thorough professional clean. There is a very small chip from the vinly on the outer edge, just before then run in groove starts [dosen't effect play] that reveals the metal center. Any Lennon fan or even Beatles fan would love to own a very very very special piece of Lennon vinyl, & you may not get this chance again. I do not know how many of these were made or if this is the only one? A very rare item. 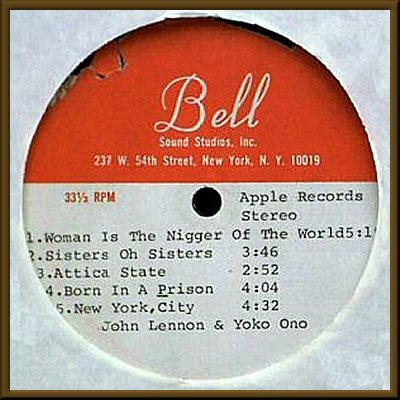 The track listing is typed on the labels, along with their duration & 'Apple Records Stereo'. The acetate is housed in a plain poly lined sleeve, but I have used a normal paper one for the photo. Recorded February - March 1972.